There are pros and cons for both laminate flooring (a.k.a. Pergo flooring) and solid wood flooring. Each have their unique advantages due to their construction. For example, solid wood flooring has the timeless warmth and charm that brings an elegance to a room that simply can’t be beat. On the other hand, it’s susceptible to high moisture and humidity levels. Laminate flooring, on the other hand, is highly durable and is much more affordable than solid hardwood floors. Laminate flooring, however, can not be refinished and is not as elegant looking as solid hardwood floors, though the manufacturers do a fairly good job of trying. Solid hardwood flooring comes in a variety of wood species with Oak, Maple and Cherry being three of the most common types. There are many variants of these three species of wood as well as a plethora of other wood species to choose from. So there is a species and a price point nearly for everyone. Hardwood flooring comes in both strip and plank widths. As the names suggest strips are narrow boards ranging from about 1-1/2 to 2-1/4 inch in width, whereas planks range in width from 3 to 8 inches. The thickness of hardwood flooring boards typically is 3/4 inch thick. As mentioned earlier one of the main advantages of solid wood flooring is that it can be refinished many times. Thus a solid hardwood floor can last for many decades with proper care and maintenance. In addition, it can be purchased with or without a pre-finish. Most people elect today to purchase pre-finished solid wood flooring as it makes installation much easier. The main disadvantage of solid wood flooring is it is susceptible to high humidity and moisture levels. Thus it should not be used in basements or other wet or high moisture areas. High humidity and moisture levels causes the solid wood flooring lumber to expand and contract which can cause the wood floor planks to cup and contract. In addition the entire wood floor can end up buckling when the moisture levels are high, effectively destroying the wood floor. Also, when the boards cup their edges stick up leaving a non-smooth flooring surface. Besides looking unsightly it can be easy to trip on the floor when a shoe hits an edge. Solid wood flooring is also sensitive to scratching. The amount of sensitivity to scratching is highly dependent on the type of wood species chosen and the quality of the wood floor finish. Solid wood flooring, however, can add significantly to the ability to sell a home. Almost every home buyer out there assigns a premium to a home when they see hardwood floors within it. If you are building an expensive home don’t cheapen out when it comes to the flooring. High end home buyers expect to see hardwood floors in the home. Using laminate flooring in a high end home, except maybe for a kids room, is a big mistake. Pergo is just a particular brand name of laminate flooring, however the two names are ubiquitously interchanged. Laminate flooring is constructed out of a subfloor wood base and a top plastic surface. Sandwiched in between the plastic surface is a photographic print of the desired finished surface, e.g. a wood look or pattern of some type. Laminate flooring ranges in thickness from 6 to 12 mm. Due to this manufacturing method laminate flooring can not be refinished. Laminate flooring, however, is highly durable due to the hard plastic surface. This said, they can scuff or become scratched over time. When this happens, there’s no choice but to tear it up and replace the flooring. Thus it is ideal for high traffic areas or for homes with young children in it. Due to its construction there are many types of finished surface patterns or looks that can be purchased. Like solid wood floors, however, laminate flooring is susceptible to moisture. If water seeps in around the panel edges of the laminate flooring pieces the panels will swell and the flooring will be destroyed. Due to its plastic surface, laminate flooring won’t stain or dent. Consequently laminate flooring manufacturers typically provide 10 or more year warranties on their products. Laminate flooring is much easier to install than compared to solid wood floors. Consequently the moderately skilled DIY homeowner can install laminate flooring. 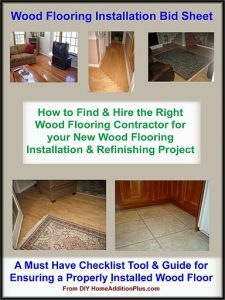 Solid wood flooring, on the other hand, should be left to the pros unless the homeowner has previous experience and the right tools to install it. To conclude, if you plan on staying in your home for many years, install solid hardwood floors. If, on the other hand you own a starter home and have small children then use laminate flooring.